Terms like databases, analytics, and statistics are ones that most of us associate exclusively with the professional world. However, data analysis isn’t something that’s only meant for data scientists. In reality, most of us exploit the ability to analyze, search, find patterns, and make predictions a lot more in our everyday lives than we do for our business needs. A lot of our day-to-day lives and much of our decision making is a form of or the result of an analytical process. Facebook knows to suggest new friends for you, Google can complete your search before you’ve even typed the third letter, and Netflix predicts which television shows you’d likely enjoy. Every time you look up a restaurant on TripAdvisor or Yelp and choose the highest rated you’re betting on the statistical chance you’ll enjoy a good meal there. We’ve always had and consumed vast amounts of data in our lives, and our brains have always looked for patterns to make sense of them. But it’s only quite recently that technology has caught up. Sensors and trackers are finally small enough to be easily carried around and used all the time, a process that’s constantly accelerating as we get closer and closer to a fully evolved Internet of Things. Mobile phones are now powerful computers that can store both large amounts of data and the necessary programs to analyze it. Finally, the emergence of the cloud has made a myriad of apps, storage options, and sharing possible. Everything from sleep to exercise, food intake, mood, and well-being is tracked, measured, and shared nowadays. However, what we get in the end, and what we are aware of and use is, just a small sample of what’s going on all around at all times. The same goes for businesses. Almost every software application collects and stores data automatically. Meaning that businesses have huge databases, some of which they aren’t even consciously creating. Of course, most businesses create spreadsheets and simple visualizations for basic reporting with this data – be it in financial departments or the sales team. 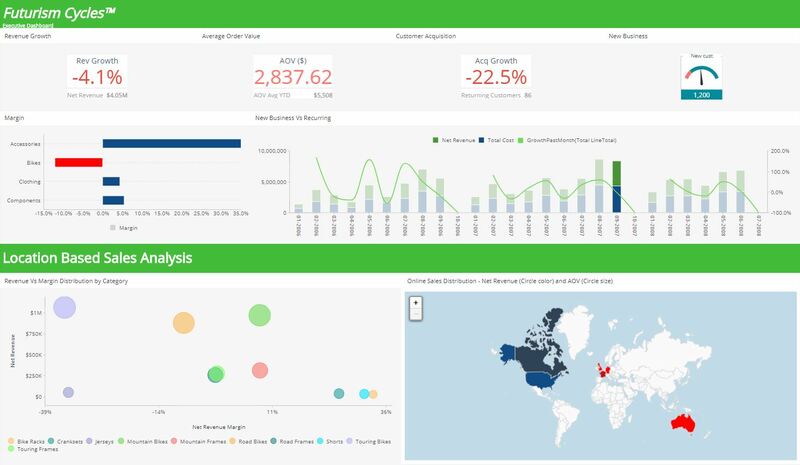 The problem is that many businesses are unaware of how they could be using more intelligent software to use data-driven insights to increase efficiency and revenue. Most of us probably utilize analytic tools and systems a lot more often and much more effectively in our day-to-day lives than we do at work. This is an issue that stems from two main factors. First, businesses collect tons of data that’s all usually stored in many different software programs. Each employee uses these different systems without the ability to connect any of them together. Look at it this way: runners who want to track their progress while training from a race look at all the different measures from heart rate to distances and time, or even number of steps taken, to see the overall big picture. This same principle can and should be applied in businesses; you should measure, for example, customer satisfaction KPIs the same way you would your running statistics, by mashing up all the given information from multiple sources. But instead, businesses still rely on disparate data sets left in independent data marts, which if brought together could have generated fresh insights. The second issue that’s stopping businesses from realizing their analytic potential is that it’s not accessible to everyone in the organization. Probably every employee in a given company has gone home and decided to watch (or not watch) a movie based on its IMDB rating. This seemingly simple action is actually the product of an aggregation of different sources, and a specific search that yielded a targeted outcome. Doesn’t this sound like something decidedly business-y? Despite this, at work, most business users tend to leave reporting and analyzing to other more “qualified” people around them. The problem is that most advanced reporting in business requires the help of the IT or R&D department. Many tools just don’t have the business user in mind and are too complicated for most employees to use regularly. This leaves a huge pool of capable talent at every company that isn’t being given the chance to shine. If someone can perform advanced analytics outside their job, why shouldn’t they get this advantage at work as well? Luckily there are business intelligence platforms that have caught on and empower business users to dive into data for themselves. Data sources and amounts are only growing, but fortunately so is our ability to utilize all these facts and turn them into knowledge. We’ve already jumped on board the Big Data train in our personal lives, but we haven’t quite done it, at least not as well as we can, in our business environments.